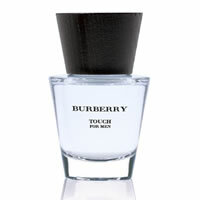 Burberry Touch For Men is a woody and fresh essence of life, a fragrance for rhythms or for silence. Burberry Touch For Men aftershave displays an initial freshness of hard-to-define notes. Buberry Tender Touch begins with violets and tart mandarin that blend subtly with invigorating waves of white pepper, softened by the smoothness of Virginia wood and oak moss, these are blended over a strong, deep breath of vetiver, white musk, and tonka bean.